The Board of Regents raised Luther College’s comprehensive fee — tuition, room, and board — by 3.5 percent for the 2018-19 academic year to $51,750. The percentage increase in comprehensive fee is up from last year, though still part of a downward trend over the past 20 years. 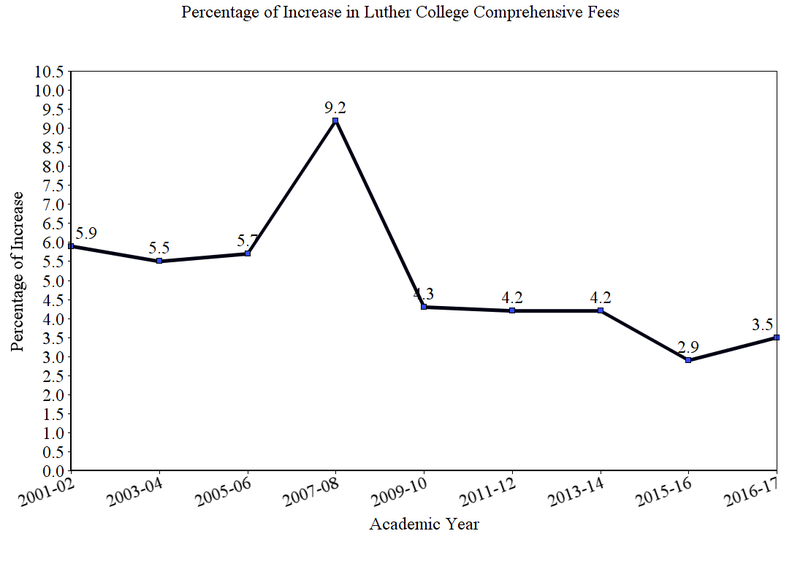 The increase in Luther’s comprehensive fee is primarily influenced by the consumer price index, which measures general economic conditions and inflation, as well as the rise in comprehensive fees of 22 other colleges similar to Luther. The comparison group of institutions that Luther measures itself by includes liberal arts schools in the Upper Midwest with similar student body sizes to Luther. For the 2017-18 academic year, Luther ranked in the bottom 25 percent for both the overall total of comprehensive fees and the percentage increases. According to the Vice President for Finance and Administration Eric Runestad, Luther aims to strike a balance when setting the comprehensive fees that takes market factors into account while still being mindful of the burdens on students and their families. Runestad also indicated that the increase in comprehensive fees allows Luther to provide more financial aid to its students. The Director of Financial Aid Janice Cordell asserted that financial aid and scholarships will not adjust to the increase in comprehensive fees for the 2018-19 academic year, however, the raise in comprehensive fees may increase some students’ need based aid. Luther designed an institutional loan program that is intended to assist students who depended on the Federal Perkins Loan Program, which expired on September 30. Perkins loans served as a need-based assistance program for low-income students who attended undergraduate and graduate schools. Cordell signaled that Luther’s institutional loan program is not as extensive as a Perkins Loan, however, Luther intends to help compensate for the expired federal assistance program. Stefan Hankerson (‘19) expressed his concerns that the increase in comprehensive fees could have a negative impact on low-income students.